These days, compact camera manufacturers are fighting what is pretty much a losing battle with phone makers to produce a quick snapping tool. Although more advanced cameras such as DSLRs and CSCs remain popular, if someone is to put their hands in their pockets to purchase a dedicated image-taking device, it's got to offer something that their smartphone can't do. With the Nikon Coolpix S800c, the brand appears to be going for the old adage, "if you can't beat 'em, join 'em" by including the Android operating system, along with integrated Wi-Fi. What this means in real terms is that alongside it being a standard camera with 5x optical zoom, a 12 million pixel CMOS sensor (which is physically larger than those found on phones) and other features you would expect to find in a dedicated camera system, you can also browse the web, download apps and do many things that your smartphone can. Many people will of course question the point of that. Well, the ability to use the myriad of photographic apps with a camera that is actually decent is, for a start, an intriguing prospect. The phenomenal success of Instagram suggests that the market is ripe for this kind of thing, even if you are going to essentially destroy that decent image you take with a retro filter and frame a few seconds later. Secondly, there's that all important Facebook generation to appeal to. By downloading the Facebook, Twitter or whatever your social network of choice happens to be app to the camera, you can instantly upload and share your latest image, providing you're connected to a wireless network. Other features of the camera include a 3.5-inch 819k-dot touchscreen, Lens-shift VR image stabilisation and Full HD 1080p video recording. As the market currently stands, there aren't too many cameras that directly compete with the Nikon S800c. The Samsung Galaxy Camera, which also features an Android operating system and a huge 5-inch screen, is perhaps the closest device. The Nikon S800c is priced with an RRP £379.99/ AU$448/ US$349.95, which puts it in the same price bracket as the Fuji X-F1 and Samsung EX2F, among other compact cameras. Realistically however, you can pick up this camera for much cheaper than the original list price. Unlike the Samsung Galaxy camera, the Nikon Coolpix S800c is roughly the same size as the average compact camera, and therefore fits much more easily into a jeans pocket. Although it's small and light, it feels just weighty enough in the hand, and has a sleek enough design to give it a nice feel of quality. It's surprising that a 10x optical zoom can house itself in such a small camera - a fairly impressive feat that means the Nikon S800c is of course much more flexible, and should produce superior image quality, compared with its smartphone competitors. There's very few physical buttons on the Nikon S800c, with most of the operation taking place via the 3.5-inch touchscreen. On top of the camera is an on/off button, shutter release and the zoom switch. Meanwhile, on the back, there are only three buttons. There's a Home button, for quickly getting back to the main screen, a Back button for easier navigation - especially useful when using apps or browsing the Google Play store - and a Menu button. If you just want to use the Nikon Coolpix S800c as a standard camera, you need to choose 'shooting' from the home screen. This will extend the lens ready for use. The camera's start-up time can be a little slow if it has been switched off, meaning you may miss the odd moment waiting the few seconds for it to start up. This is attributed to the fact that the camera needs to start up the Android operating system, and thus has start up times similar to a phone. Once the camera is switched on, though, operating it is generally very quick. The Nikon Coolpix S800c is pretty much positioned as a fully automatic camera, and as such there aren't too many parameters that can be altered. Those that can, including white balance, sensitivity (ISO), and exposure compensation, can be altered via the onscreen commands. As for the touchscreen itself, it's capacitive and therefore very responsive and easy to use. 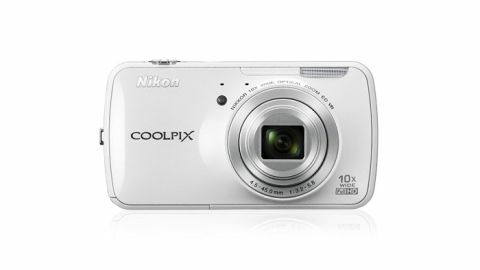 For existing users of Android smartphones, picking up the Nikon Coolpix S800c will be a very easy transition. Or if you want to just do some straight shooting, you can ignore the Android section altogether and head straight into the shooting or playback area by tapping the appropriate icons on the home screen. When you do want to access the myriad of different apps available, you'll find several, such as Google Mail, already installed. To download more, visit the Google Play store. Here you'll even find the apps categorised, which is useful if you're only interested in photography-related ones, for instance. Once an app is installed, using the camera becomes pretty much identical to using the same app on a phone, only with the benefit of higher quality images and an optical zoom lens. Installing apps such as Facebook or Twitter enables you to share your images instantly, so long as there's a Wi-Fi connection available. It's worth downloading these as soon as you get the camera out of the box, to save hassle later.